World Wide Menu, Inc. was founded in 1989 and has grown to become one of America’s largest manufacturers of menu covers for the restaurant and hospitality industries. In addition to having one of the most extensive standard product offerings in the industry, we specialize in custom cover design and manufacturing utilizing turned edge, turned & stitched, flush stitched, heat seal and cut & seal construction methods. Contact World Wide Menu, Inc. for a custom quote. Established in the year 1989, World Wide Menu, Inc is one of the largest American manufacturers of menu covers and customized menu holders. Rendering our services to restaurant and hospitality industries at large, we help to enrich dining experience by rendering premium menu covers which are beautifully designed and created through our craftsmanship. Offering menu covers at large variety, designs, sizes, colors, materials and styles, we ensure to cater our products and services at the most affordable budget. 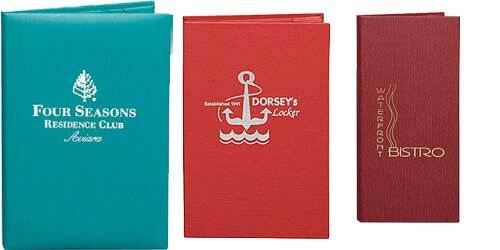 We take pride in offering top notch services to our clients with custom products in a large selection of menu books and menu covers made from high quality and finest materials. We render services to every kind of requirements from a simple design for café to a five star custom menu covers for restaurant. All of our menu covers are lightweight, versatile and robust which are easy to clean and maintain. Our clients love to get associated with us for our highest quality products and our commitment for on time delivery. Our delightfully structured menu covers are attractive gaining high attention thereby complementing menu in restaurants and hotels. We create products that leave a lasting impression on guests. With our in house graphic designing and printing services, we execute services for providing fully fledged menu covers and menu holders to our clients. Adhering to our highest standards, we look forward to establish long term relationship with our existing clients and also build new ones. We are here to serve our clients with our custom services for menu covers, clients just need to send their logos/artwork to us and select the look and feel of according to their preferences and leave the rest to us! You can get varied options for cost effective scans in the market that use latest technologies to get high quality results. If you send the accurate pieces of artwork to us, we will be able to save a lot of time, energy and money. Please make sure that you send us great looking scans of artwork which are done at professional printing places that enables good photo restoration. The digital files delivered from slides, film negatives or analog photos should bear good clarity. Scanning of the artwork should be of a proper size considering the fact that it is something which shall be highlighted on the main cover. Too big or too small artworks might ruin the overall look of the menu cover. The image format for all artworks you send us should have JPEG or TIFF file format. If you are using any other format, please make sure to verify before sending it to us. What to expect while placing an order with us? We will be eagerly waiting for your orders! Once the order is placed, you can relax and let us do the rest of work. We provide our online and faxing services for placement of orders. After making a choice for the product you want, you can ask for customization. Each of your need is carefully heard and processed accordingly. There are numerous color and styling options available for each kind of menu cover and we try our best to deliver the finest designed product to you. World Wide Menu, Inc. knows how to keep its clients happy and satisfied; therefore, it dedicate works towards the betterment of service every time. In particular, talented craftsmen help in producing supreme collections of our products which are unique and highly durable. These products are then delivered to you with utmost care in handling and shipping. You can expect our product delivery right on time and we also deliver sample products to you on request. For any clarification, you can contact our customer service center. We give benefit of returns and in case of return of any authorized item, a Return Authorization Number is mandatory. Please contact a Customer Service Representative within 10 days of receipt of product. Certain restocking charge is applicable for returns. All items should be always returned with their original packaging and original condition. Only after inspection of goods returned, World Wide Menu Covers will approve a credit to your account. Some of the items are non returnable therefore, please ensure to mark any return cartons with Return Authorization Number.